In the discussions for a Menu for the Banquet some attention was paid to providing a historical link between then and now. It was suggested that we could stew up some meat (type — whatever was available) along with some root vegetables (probably swede) and serve with a hunk of bread. There would be no potatoes — The Americas have not yet been discovered by Europeans in 1415. For dessert, there would be a pudding: suet essential and possibly some apple. Drinks would be beer (weak) and there may be some wine. On reflection this Menu — though historically in keeping did not appeal to many of us at the table, therefore, the meal that was to be served was ‘inspired’ by the times of Agincourt. England as a sea faring nation was represented in the choice of fish, while English national pride was present in the Beef and Yorkshire Pudding. On to the dessert, where there were the fruits available in Pas de Calais, smartly presented with the international and modern addition of ice cream. The cheese however, was something special. It was made from goats that resided in the Azincourt countryside, feasting from the grass that lay on the battlefield. These goats are the descendants (possibly) of the goats that were there 600 years ago! Alongside the meal were fine wines to complement the food that would have brought the two sides of 1415 together in happy merriment. The memorial at Azincourt, France, along with the new viewing platform at the site are an important part of the 600 commemorations, marking both the original battle and providing an important point to inform future generations and encourage visiting and reflection. The Agincourt Commemorative Fund enabled military personnel with an appropriate relationship to Agincourt history to attend and to parade with today’s French military personnel. This event marked effectively how nations formally at war can now come together in partnership. This formed a fitting tribute to the men who had fought on both sides 600 years earlier, and the Trustees were delighted to support the erection of a memorial on the battlefield to the dead of both sides which was inaugurated on the anniversary by HE the British Ambassador to France and French officials from the Région, Département and Communauté des Communes. The fund also supported the re-enactment in July 2015 at the battlefield which involved groups from the UK, France and further afield. 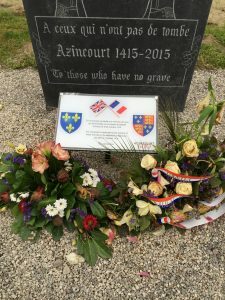 The Azincourt Museum and battlefield hosted a key memorial weekend in July 2015. Re-enactors and amateur archers gathered to take part in events including the historic re-enactment of Rain of Arrows, alongside educational workshops. The site commissioned a new and permanent memorial to the Agincourt Battle which was unveiled at the site on the 600 anniversary of the Battle. Representatives of the Agincourt 600 Commemorative Fund were present. The British also sent military representatives as part of their community engagement. In order to encourage more visitors to visit the battlefield and to be able to examine the site a new viewing platform will be erected. The platform will enable better interpretation of the physical history of the battlefield. 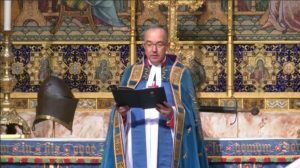 This service was held on the actual 600th anniversary of a service of thanksgiving held in the Abbey when the news of the victory reached London. The service then was attended by the Lord Mayor and the full panoply of the City and Henry’s stepmother, Queen Joan. At the service in 2015 there was a congregation of almost 2,500 people. 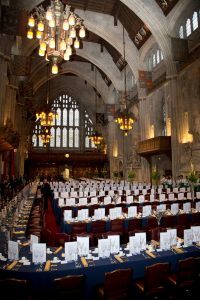 Of these, approximately 1000 were official guests representing the armed services, Her Majesty’s Government, the orders of chivalry, the Lieutenantcy, the church and the cities of London and Westminster. Two members of the Royal Family were present. Many volunteers contributed to the running of the service: regular Abbey volunteers and students from Bancroft’s School. 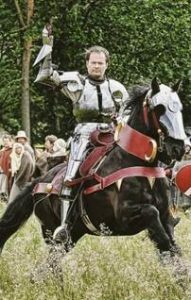 The most important feature of this service was that it was a commemoration of those who fought for their liege lord on each side. The Agincourt 600 Trust had, from its very outset, an utter determination to bring French and British heritage together for all activities connected with 2015. The Trust funded the attendance of a group from Azincourt and district; one of whom read an account in French of the meeting in 1915 on the battlefield of French and British troops to commemorate the 500th anniversary. The French also helped lay a wreath on the tomb of Henry V during the service. 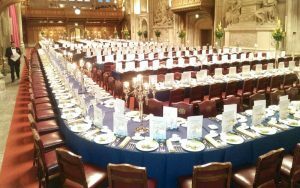 One of the many moving features of the service was the procession of all the masters of the City of London Livery Companies. They were followed by the masters of the five warrior livery companies (the Armourers and Brasiers, the Bowyers, the Cutlers, the Fletchers and the Gunmakers) who processed with the sword of Henry V.
Robert Hardy CBE, the actor and longbow expert read from the Prologue of Act IV from Henry V.
The Right Honourable Lord Mayor of the City of London, Alderman Alan Yarrow and Professor Anne Curry, chairman of the Agincourt 6 00 Trust, read the lessons. 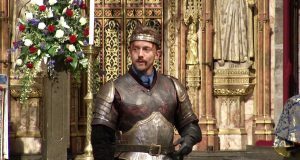 The actor Sam Marks, a member of the Royal Shakespeare Company delivered the St Crispin Day’s speech from Act IV of Henry V. He was in full armour and strode through the whole of the Abbey while speaking. 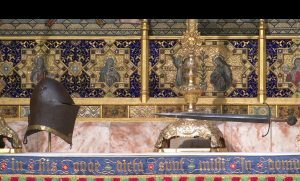 The sermon was given by the Bishop of London, the Right Reverend and Rt Hon Dr Richard Chartres. Prayers were read by Shenice Osisioma and Robyn Ridgeway, two students from the City of London Academy in Southwark and by the Rev Christopher Stoltz, Minor Canon and Presentor of Westminster, Rev Professor Vernon White, Canon in Residence and Dr Sinclair Rogers, chairman of the Agincourt 600 Committee. M. Pascal Deray, the Chairman of the French local authority in their Azincourt Region, Les Sept Vallées, read an account in French of the meeting of French and British soldiers on the battlefield of Azincourt on 25 October 1915. The text was taken from a contemporary account published in L’Illustration, on 27 November 1915. Professor Anne Curry, Dr Sinclair Rogers and M. Christophe Gilliot, the director of the Centre Historique Médiéval at Azincourt, jointly laid a wreath on the tomb of King Henry V during the service. The Blessing was given by the Dean of Westminster, the Very Reverend Dr John Hall.